Deep Blues explores the archetypal journey of the human psyche through an examination of the blues as a musical genre. The genesis, history, and thematic patterns of the blues are examined from an archetypal perspective and various analytic theories – especially the interaction between Erich Neumann’s concept of unitary reality and the blues experience. Mythological and shamanistic parallels are used to provide a deeper understanding of the role of the bluesman, the blues performance, and the innate healing potential of the music. Universal aspects of human experience and transcendence are revealed through the creative medium of the blues. The atmosphere of Deep Blues is enhanced by the black and white photographs of Tom Smith which capture striking blues performances in the Maxwell Street section of Chicago. Jungian analysts, therapists and psychoanalytic practitioners with an interest in the interaction between creative expression and human experience should find Deep Blues a worthy contribution. Deep Blues also appeals to ethnomusicologists and enthusiasts of all forms of music. 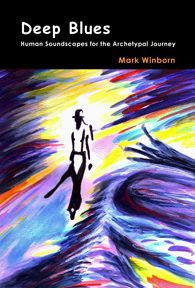 In his ever-fascinating book, Dr. Mark Winborn goes where few authors on the blues have ever gone: into the profoundly psychological implications of the genre. A Jungian by training, Winborn argues convincingly how the blues communicates for reasons that extend to the symbolic language of the unconscious. His results are sure to inspire future research in not just the blues but in other areas of traditional culture and the creative act. Just like a fine bluesman, Winborn ‘riffs’ on the various psychological aspects of his topic: the genesis of the sound, the unitary reality created in playing and listening to the blues, its archetypal manifestations and healing potential, and the influence of the personality of performer and performance. As he states, ‘the blues belongs among the great arts because of its extraordinary capacity to embrace, embody, and transcend the opposites, especially as they become manifest in the experience of tragedy and suffering.’ Using original lyrics throughout, Winborn invites us to reimagine the power of the blues in its ability to deepen our own soulfulness. Mark Winborn, PhD, NCPsyA is a Jungian Psychoanalyst and Clinical Psychologist. He is a training and supervising analyst of the Inter-Regional Society of Jungian Analysts. Dr. Winborn maintains a private practice in Memphis, Tennessee where he is also currently the Training Coordinator for the Memphis Jungian Seminar.